Eve Organics Mineral Foundation, Setting Powder and Blush. I have been turning more to mineral makeup as a safer alternative to conventional cosmetics with their multitude of unknown chemical ingredients. In the process, I have discovered some wonderful companies and products that I think can help you look just as beautiful without risk to your health. One such company I’m very fond of is Eve Organics mineral makeup, which I am working with again for this review. Besides making gorgeous cosmetics that avoid any possible toxic ingredients, Eve Organics takes safety to a new level by sealing their products to ensure absolute purity. As a consumer, this extra step gives me peace of mind as well. This time I was provided with full sizes of their loose mineral foundation, a setting powder, and a blush. Let me start by talking about the loose mineral foundation that I chose in Creme Brulee 02. This was a pale beige shade that went on like silk and gave my complexion a smooth, poreless look with natural sunscreen protection and anti-inflammatories. However, this color was lighter than I expected from the screen shot. I would love to review the Light Olive 03 because this would probably be more my ideal shade, but I was unsure when I originally selected a color from their foundation shots on the screen, which appeared rather dark and yellow compared to the Creme Brulee 02. Now I think that Light Olive 03 would probably be a Light -Warm and the one closer to my coloring. The Tinted Setting Powder was wonderful and gave a nice finish without a powdery mask look with just the right amount of color without changing your foundation shade. I also liked the fact you can wear this tinted setting powder as a light foundation as well. (The Tinted Setting Powder is the darker shade in my picture). Lastly, I selected Eve Organics Joyful Blush. This is a stunning neutral peachy-pink in my opinion that would bring out the best glow for practically everyone. The color is very natural and one of my favorite items from how it perks up your complexion. I really love Eve Organics products that I tried so far. Honestly, I do think you will love this company also once you give them a try. 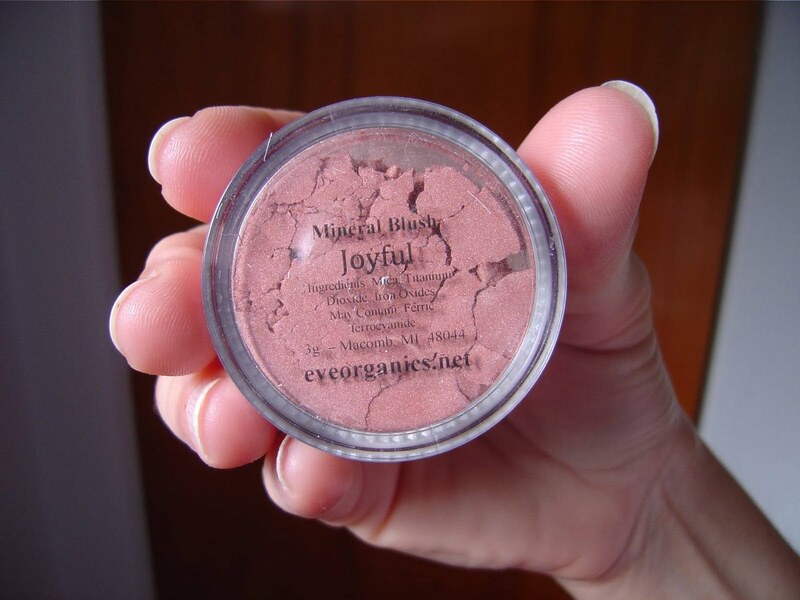 This is the Joyful Mineral Blush. Next Post I’m Nuts About My Homemade Salad Dressings! I wannna try the Bronze Babe Lip Gloss.